Over Labor Day weekend, we decided to vacation in Manitou Springs, one of our favorite nearby getaways. There are plenty of family activities to do, such as visiting the Mantiou Cliff Dwellings, the Cave of the Winds, the Penny Arcade and more. We opted to stay in a motel and booked a night at the Comfort Inn. I tried to plan ahead to make our trip as low-waste as possible. We brought a cooler with milk, deli meat, cheese, fruit, and a loaf of bread (don’t forget a knife if you are bringing unsliced bread). I also packed a basket of dishes including a few plates, a couple of bowls, silverware, two mugs, four water bottles, and a bottle of dish soap. I made sure to pack one microwavable plate and bowl in case we needed to heat up our food. 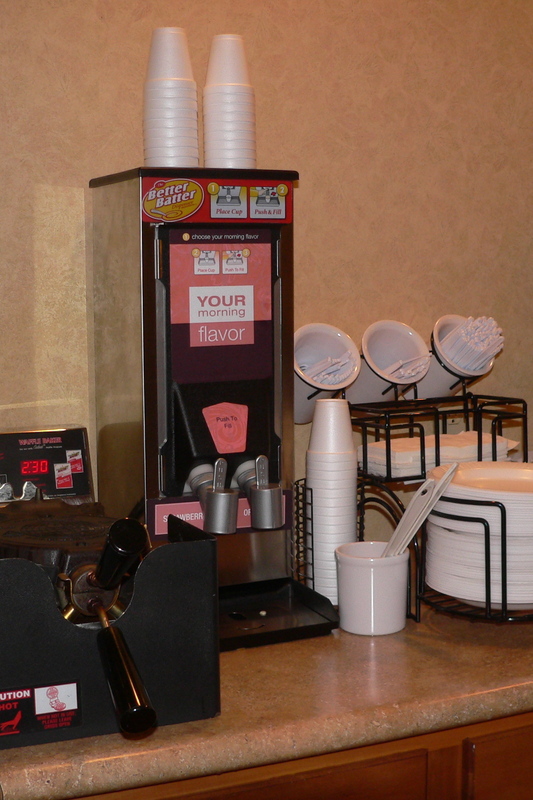 When we walked into the motel dining room for the free breakfast, I couldn’t believe the waste before my eyes. All of the tableware was plastic, the cups, bowls, and plates were polystyrene, and the plethora of single-serve cream cheese, butter, and yogurt seemed to laugh at my efforts. We were the only group in the room with our own dishes packed from home. Dan and I shared one mug for coffee and the kids shared the other for milk. We would have had waffles, but each serving of batter was measured out into a polystyrene cup, which was immediately tossed into the trash after being poured. 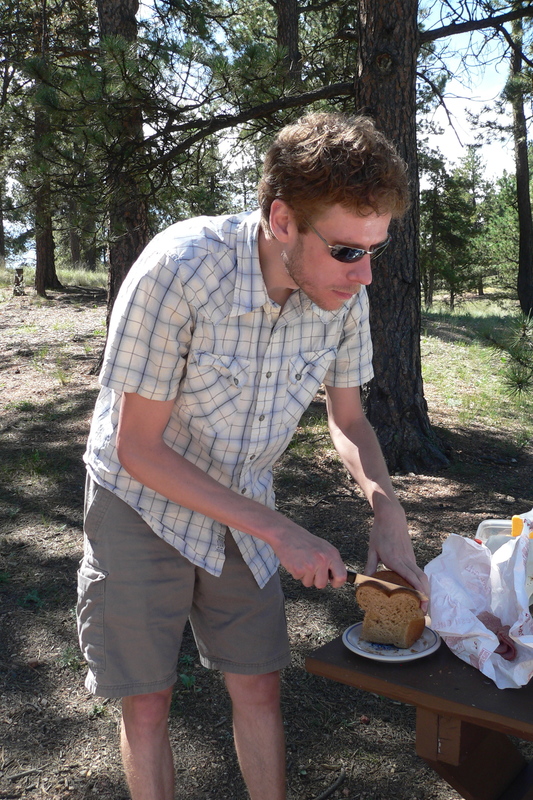 The kids had cereal and bagels, I ate fruit and a danish, while Dan toasted an English muffin and made himself a sausage and egg sandwich. While we sat and enjoyed our breakfast, I couldn’t help but notice the trash can next to me fill up quickly as people finished their meals. Everything was disposable and it was hard to watch it all get tossed without a second thought. The thought of the compounded waste being created by all of the motels all over the world at that moment was a bit depressing, but we tried to focus on our efforts and stay positive. Once back in our room, I noticed the irony of our motel stay. 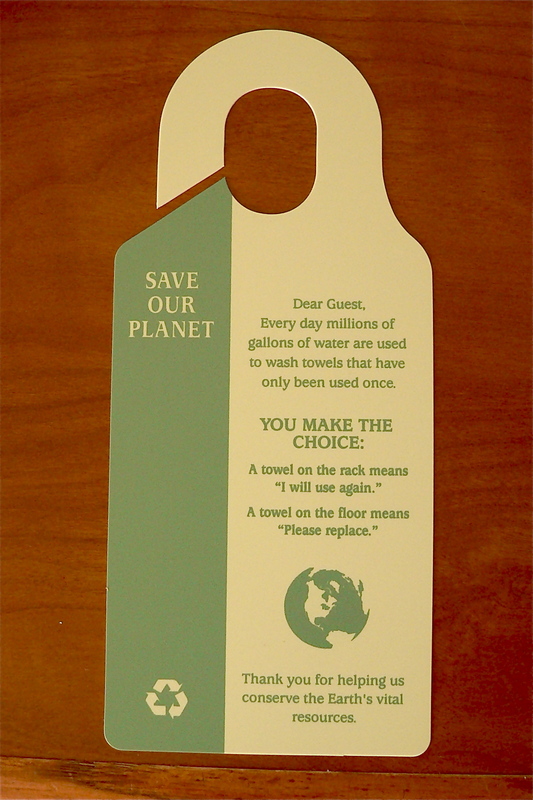 Hanging in the bathroom close to the miniature bottle of shampoo and plastic-wrapped soap bars was a sign asking guests to reuse their towels to help the motel “conserve the Earth’s vital resources”. What? Yes, it can be a hassle to pack your own dishes, but if more of us do it maybe it will catch on. Even if we can remember to pack one reusable mug, that is one step in the right direction. The motel says it is trying to be "green"...really? Gallery | This entry was posted in Groceries, Replace your Plastics and tagged bring your own dishes, motel, plastic-free motel stay, polystyrene cups. Bookmark the permalink. Amazing what a dichotomy you experienced there. Maybe you pointing out how hypocritical they’re being will help them see the light 🙂 The more and more people to voice things like this, the better! I was a bit surprised at the hypocrisy. I do hope that little by little we can make a difference. It would be so easy for the hotels to use ceramic plates and silverware. Don’t know where you stayed, but you might email their corporate office and suggest to them to stop using so much disposible goods for their breakfast service and point out the dichotomy of their mismatched efforts. I haven’t got around to contacting the motel yet, but I do plan on it. If they even provided some option of reusable dishes that would be a step in the right direction. Offering no alternative at all to disposability is frustrating and leaves the motel guests with no other option but to be wasteful during their stay. Ok, I just finished sending my comments (along with a link to this post) to Choice Hotels. If they respond back, I’ll be sure to post it.